Are you tired of piles of papers about leads and sticky-note reminders covering your whole desk? We’ve simplified your life and packed everything you need into a single card. In amoCRM, every contact, lead, customer, and company that you work with has a profile. It’s just like someone’s Facebook profile, only inside amoCRM. There are 4 types of data in amoCRM: leads, contacts, companies and customers. And the good news is that the data is linked, which makes it easy to navigate from one to the other. Leads are prospective clients. In simple words, they are deals and projects - something that can bring you money. Now, imagine you work in a web agency and you have different ongoing projects with a lot of different companies. One company is called California Cakes and they want to set a good Facebook Ads campaign. So, here’s the lead called "California Cakes Facebook Ads". Contacts are people you can reach and talk about business with. Sometimes, it can be a person who is in charge of the company and sometimes, it can be a manager. Regardless of their title, this is going to be a real human being. Companies are places where the contacts work. Oftentimes, a company can have several contacts because you have to navigate different gatekeepers or work with different people. Customers are those who have already made the first purchase. This type of profile is perfect for tracking repeat buyers as well as subscriptions. Want to know more about our data? Check out our post about types of data and easy way to import it. So, you know the company, the person you are working with, their contact data and you have all the necessary information at your fingertips. But that’s just the beginning. Here you can find the lead’s name and the stage of the pipeline of where he or she currently is. This lead is in the second stage called Offer Made because we’ve just sent over a commercial offer. NOTE: And the pipeline stages are totally easy to customize too! Check out our video that shows how to customize amoCRM according to your business process. 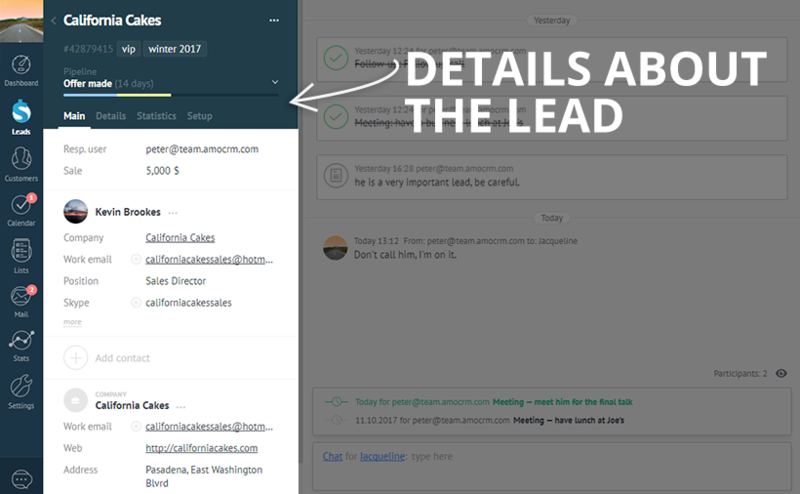 The main tab tells you about the main lead's details, so you don’t have to strain your eyes trying to find the information. Wanna call Kevin? Sure thing, here’s his skype. Wanna know how far he lives from the place you’d like to have business lunch at? No problem, here’s his address. And remember, Kevin’s the big cheese, so stay alert! No more suffering trying to find out what happened with Kevin! The event feed contains all interactions, events, tasks and notes, so that nothing is hidden or lost! At the bottom of the page, there is a tab with upcoming tasks. Once completed, you can type in the result as well as schedule a follow-up task for later. Leave some important notes for you or your team. You can also pin notes, so they don’t get lost in everything else! It is a well-known fact that a lot of team communication can happen behind closed doors. Oftentimes, sales reps discuss something particular related to the deal, but then forget about it once they get back to work. Well, long gone are the days of confused managers! 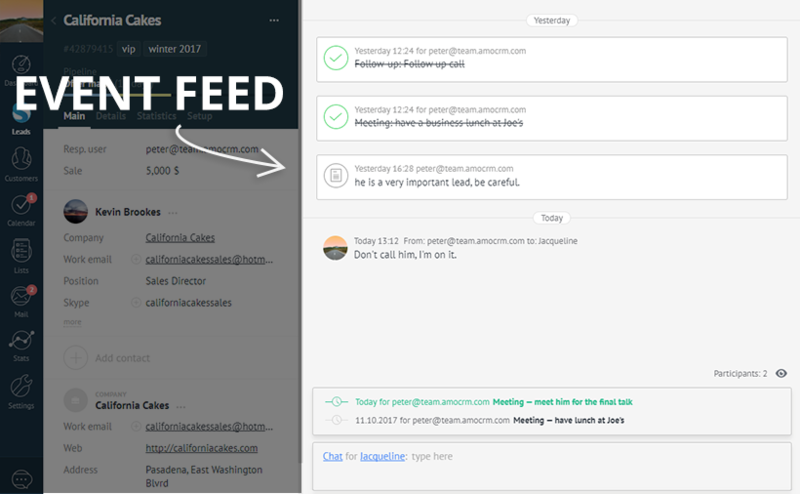 amoCRM gives you the opportunity to talk to your team members right in the event feed. Don’t let Kevin forget about the meeting! You can send emails straight from the lead card, so you don’t need to switch to your mail app to write to him. All incoming messages from Kevin will be attached to the lead profile too. Do you want to add a specific field, but it’s not in the system? Don’t worry, just click the ··· button and you can customize the sales process to your liking. There you can print the lead card, work with its tabs, manage the pipeline settings, add custom fields for the lead in case you need extra data, and export or delete the lead. Segmentation of your leads is an important part of the sales process. Segmenting can help you better organize your leads, edit them more efficiently, and improve your sales pipeline. To do that, you can add Tags. You can create any tag you want by simply clicking on the tag field. For example, there are customers that can bring a lot of revenue. If they’re a special group to you, why not add a ‘VIP’ tag to provide the needed attention to these customers. And don’t forget that you can set up specific automation sequences for leads with particular tags! To add some extra fields, click the setup tab to go to Lead fields. Just think about what you might need when talking to Kevin? How big is his company? Is he responsible for the final decision? Check out our post on how to customize and group fields! It is always good to know who your customer is. It is important to be able to customize the lead card to your specific business. amoCRM lets you do exactly that. Don’t hesitate and try the 14-day trial. Got any questions? Feel free to ask? Writing about all things important.